i. Our Household Concierge can offer a diversified and complete array of professional household services on demand. Household Concierge is a gradually-known service. Estates with Household Concierge will be a necessity to demonstrate your nobility. The service can definitely boost the business of developers, real estate dealers, property management organisations or other related industry. The Household Concierge in Indihome has started to operate since 1st November, 2006. It aims to provide the residents with one-stop household services. In addition to the diversified services, it is relationships with the residents that the service intends to build up and maintain by understanding the unique requirements of the residents. In doing so, our service quality can thus be enhanced. 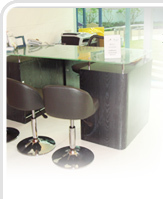 One-stop household services by contract which offer receptions, hot lines and an exclusive website.